Come along to the Reading Rooms in Billericay High Street on Saturday 10th November between 9:00 am – 3:00 pm when Hamelin Trust will be holding a Christmas bazaar. 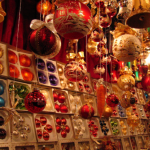 You will be able to get Christmas gifts, toys, jewellery, bric-a-brac and much more! Tea, coffee, soft drinks and biscuits are available for £1. Come along and let the Christmas magic begin!